First dahlia bloom of the season. Oh my the colors are so awesome!! I can't get Dahlias to grow but my goodness how beautiful they are. What a beautiful shot!!! Beautiful! 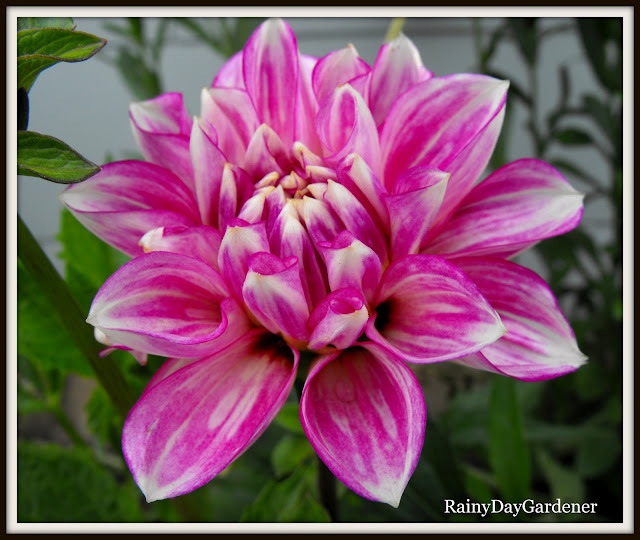 I just noticed a couple of days ago that I have a couple of dahlias blooming too. They're such gorgeous flowers. That flower looks almost too good to be real! More like a painting than a photo. The stripey colouring is very attractive. I hope you get lots more like it. What nice colouring on the dahlia. Dahlia are really popular in Northern Ireland however they generally have to be lifted in Autumn and stored as our ground is too wet for them to over Winter so I haven't grown them. They are superb plants. Beautiful! Fuchsia is my favorite color!